If you love pesto, garlic scapes are in season right now. And in my opinion, garlic scapes are grown for pesto. 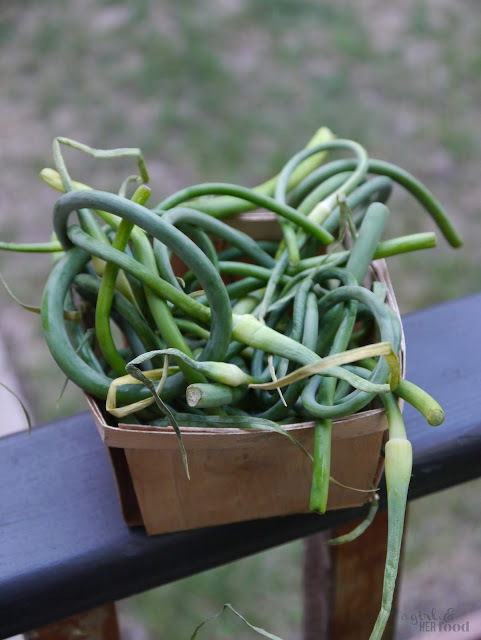 Some of the best pestos I ever tasted used garlic scapes, and they are most easily found at your local Farmer's Market. I bought some at Chicago's Green City Market. Pesto is super easy to make, and this recipe is straightforward. You can freeze leftover pesto in a ice cube tray to enjoy at a later date too. Place the garlic scapes in a food processor and pulse for 30 seconds. Add the pine nuts and pulse for about 20 seconds until crushed. Make sure to scrape the sides of the food processor before continuing. Add the olive oil and process on high for another 15 seconds. Next, add the Parmesan cheese and pulse until all the ingredients are combined. Finally, add the basil and lemon juice and process until reaching the desired consistency. Add salt to taste and serve with your favorite pasta or bread. I also enjoy the pesto on fish or chicken. Enjoy!